Today’s tutorial includes information that expands beyond the basic details you need to write your short proposal for this class. Since you are likely to write more than one kind of proposal once you enter the workforce, today’s thorough details are sure to come in handy. It’s also great for those of you who learn better with videos than with reading. 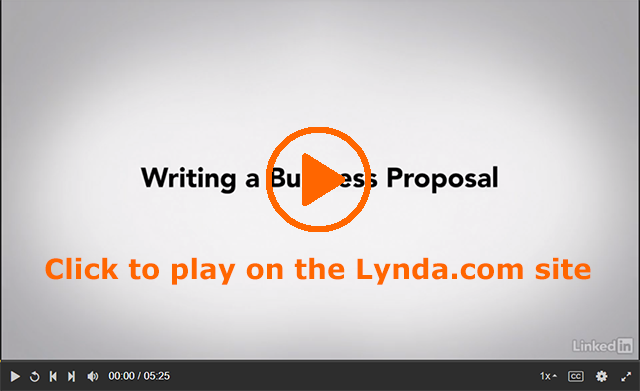 The Lynda.com video Overview of Business Proposals (5m25s), introduces the four different types of proposals and goes on to discuss common proposal characteristics such as document structure, the necessary length, and audience needs. As you watch the video, consider how the information relates to the short proposal that you will write. Since you will write about different kind of writing and for different reasons, how can you apply the information the video shares? If you have experience writing proposals in the workplace or elsewhere, how does your experience match the information in the video? Writing up a proposal truly is a daunting process. That being said, I feel that the more proposals you are exposed to and the more proposals you write the easier the process becomes. I feel that the hardest kind of proposal is any type that is unsolicited. This kind of proposal seems reminiscent of “cold calls”, which is when a phone solicitor calls and asks if you want to buy kitchen knives. My father who recently retired from sales says that it take 8-12 cold calls until you get 1 success. If you transfer that over to unsolicited proposals,that is a pretty low success rate. In high school, I had to write a proposal asking my teachers to approve a research project that I would study for two years. At that time, the proposal did not have strict expectations for content and structure, allowing me the freedom to say what I felt was necessary to say. Personally, I like the idea of our Short Proposal assignment because I believe that we will learn a lot of professional skills during the creation and revision stages. Seeing as how I will most likely be working in Research and Development for the first few years following graduation, I think this project will provide me with a lot of information that I can use while writing future proposals.